Conscious Wisdom is an email newsletter sent directly to you each day. Each issue contains inspirational guidance and wisdom designed to help uplift your spirits and support your conscious efforts at personal and spiritual growth and development. We're offering a Two Week Free Trial subscription, so that you can experience personally how Conscious Wisdom can help change your life. By reading, studying and thinking about the inspiration and guidance which we email to you, for 3 to 4 minutes a day, you create an effective introspective tool that will help you experience an ongoing positive change in your life. We all know that when we try something new together, whether its going for a walk each morning or learning a new craft, we stick to it longer and get more benefit from it through the group interaction and commitment. The same is true with reading and applying this daily inspiration and guidance. If you and your friends receive the same Conscious Wisdom each day, you can also create your own support group to maximize your application of it. This could include taking the time to discuss the daily inspiration and its meaning each morning, and then another discussion later in the day to explore how each one applied it during the day and what results were experienced. When trying to create new positive habits, it always helps to have friends who are trying to do the same thing with you. After creating your own subscription to Conscious Wisdom, why not subscribe some of your interested friends as well? A perfect gift to share in the development of a wonderful life. To make sure that Conscious Wisdom is right for you, we're offering a 2 week Free Trial so that you can experience for yourself what benefits can be experienced - why not give it a try? 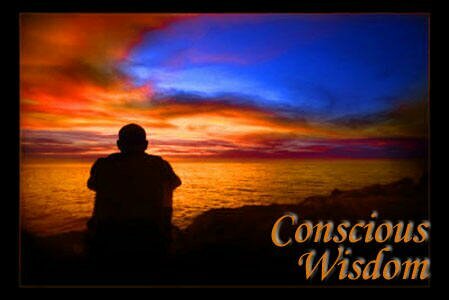 Welcome to another issue of Conscious Wisdom. Each morning is a fresh beginning. We are, as it were, just beginning life. We have it entirely in our own hands. And when the morning with its fresh beginning comes, all yesterdays should be yesterdays, with which we have nothing to do. Sufficient is it to know that the way we lived our yesterday has determined for us our today. And, again, when the morning with its fresh beginning comes, all tomorrows should be tomorrows, with which we have nothing to do. Sufficient to know that the way we live our today determines our tomorrow. To gain the most, we must simply place our full, loving attention on the first hour of this new day, with all its richness and glory, with all its sublime and eternity-determining possibilities, and each succeeding hour as it comes – but not before it comes. This is the secret of character building and life enhancement. Begin your application of today’s lesson by reading the selection very slowly. Make a concentrated effort to understand the deep meaning of each word and each sentence – each paragraph and the entire selection. If you have time, you might write down your answers to these questions in a daily journal. Finally, think about and perhaps write down what improvement can come to your life by applying today’s lesson. Try to state a succinct benefit and goal which you can obtain today, by applying the essence of today’s guidance. Later, at the end of the day, review your thoughts and notes to determine how you succeeded at applying the inspiration and guidance. This entire process creates a way of introspecting – a way of becoming more consciously aware of your thoughts, your habits, your actions and your accomplishments. It is important to not be too hard on yourself. Your ultimate goal in using Conscious Wisdom is to support bringing about positive change in your life. Change is not usually instantaneous – it takes time. You can most effectively support yourself in this growth process by celebrating each small victory. If you are able to implement each day’s lesson to any degree, that is positive change. By building on each day’s accomplishments, even if they appear to be small, tremendous positive growth will occur over time. Be patient and loving with each day’s effort and very soon you will see remarkable change in your life, attitudes and accomplishments. The more calm and relaxed you are prior to beginning each day’s introspection practice, the more effective your practice will be. If you have time, take a short walk before beginning, or take a few deep breaths to relax and slow down. Relax and calm the mind. Just for these few minutes, let all thoughts of the outer world and your daily responsibilities fall away. At the conclusion of your practice, allow yourself at least 60 seconds, to just sit comfortably with your eyes closed, and just bathe yourself in the glow of well-being which you will discover. Try to absorb that glow into every cell of your body. This experience alone can be very energizing, healing and life changing. Each day you will receive a new inspirational message designed to support your improved health, prosperity, success, self-esteem, cheerfulness, positive attitude and sense of connection with God. Some are short – and some are longer, but all are created to support you in your continued growth. Especially good times to read and review each day’s message are in the morning, just after waking and at night, just before going to sleep. We hope you enjoy today's Conscious Wisdom and wish you an ever increasing sense of happiness and well-being. This email and all its contents are copyrighted by The Conscious Living Foundation, 2007, all rights reserved. If you wish to cancel your subscription to Conscious Wisdom, click Here and then press the "Cancel Subscription" button. Email delivery of your first daily issue of The Conscious Word will be sent upon verification of payment. If you prefer to pay for your product through the use of a credit card, please click the "Subscribe" button, below. If you would like to receive The Conscious Word for 2 weeks at no charge, click the "Free Trial" button. Please note that after your 2 week trial period, your paid subscription will continue automatically unless you cancel your subscription during the trial period. Subscription To "The Conscious Word" Daily Affirmation. The Perfect Combination To Enhance Each Day's Growth and Inspiration. The "Conscious Wisdom" Subscription costs $3.50 per month. This is a recurring subscription and will automatically renew from month to month. However, you may cancel at any time by clicking the "Cancel Subscription" button, above.